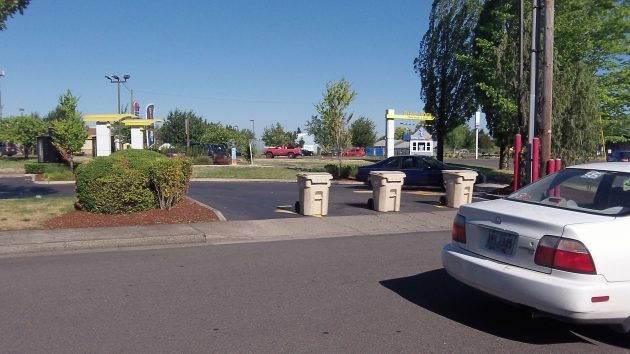 No McMuffins: A power failure Wednesday forced West Albany’s McDonald’s to close temporarily. Years ago, whenever the lights went out you were pretty much left in the dark where information was concerned. Now, Pacific Power does a good job keeping customers informed. But sometimes a little more detail would help. On Wednesday afternoon, a power failure affected nearly 2,700 customers in parts of West Albany. If any of them called the utility’s toll-free outage number, they leaned that the company was aware of the problem, was making repairs, and people could expect the lights to come back on by a certain time. Customers got the same information on Pacific’s website, where it updates outage reports every 30 minutes or so. But as for the cause, the company told people it was a “transmission interruption.” Well, yes. But that’s like saying that unemployment is caused by people not having jobs. Pacific itself did better the next morning (June 30), when 559 customers in and around Tangent lost power. The cause, Pacific said online, was a “vehicle accident.” Apparently yet another car or truck had hit a pole. That’s about as far as the power company can go and let people know what’s going on. Good call Hasso, on the “impact” use. My colleagues and I used to laugh about the Fire Dept. spokesperson reporting that, “Upon arrival at the scene of the conflagration, the first responders determined the entire agricultural storage facility was involved”. Of course, it could have been stated simply that when the firemen arrived the whole barn was on fire. Pretension is a killer of common sense. I had the same reaction: impacted? I have had impacted wisdom teeth and have felt the impact of high winds at the Coast buffering my Mini Cooper, but this use of the word escapes me. The tendency of speakers and writers to use impact instead of affect or effect because they don’t know the difference can be explained by laziness and the lack of proper grammar taught in schools. It’s very sad to read. I need a job and would love to edit the DH articles for them. Absolutely! Of course, I mean “quite” which served us well until the talking heads on TV needed to waste more of our time. Power companies usually don’t want to say too much about the cause of outages. Many times, particularly during the winter storms, the outages are caused by poor system maintance,eg, rotten poles and crossarms, trees to close to lines, substation equipment not properly maintained. Blame it on weather and they get away with it. Power companies have spokesmen that are trained to use high price words like, “the pole was impacted” to smooze the public. Actually, Pacific Power is not shy at all about explaining the actual cause of outages when asked directly, which I didn’t do in this case. Spokesman Tom Gauntt sent a note saying the pole involved Wednesday was a BPA pole, so as far as Pacific was concerned, the power went out as the result of a loss of transmission. As for the use of “impacted,” that came from the police. Well Hasso, ya made me go over and look at the newly replaced pole this morning, As I suspected, it is a PP&L pole on a their line coming from the BPA sub to the adjacent PP&L sub. So, the information you got from the PP&L spokesman was not correct. Having worked on the BPA power lines in the area for 30 years, I just could not remember a BPA pole adjacent to Queen Ave that would be vulnerable to “Impact” from a car. Sure enough, I remembered right. Next time you ride by, look at the PP&L ID on the new pole. As far as my statement about power companies reporting causes of outages: I know enough about the politics of power system reliabilities to be dangerous. My knowledge is that power companies are really under the the microscope of big brother to have a very reliable power system. If they don’t, there are investigations, fines and sanctions. And how would this extra information actually change your life or behavior? “Want to know” is not the same as “need to know.” Yes. It would be “nice.” But to help you live your life better? Not so much.